Wang Ping’s new collection Ten Thousand Waves looks at a wide swathe of Chinese history and literature, and examines various issues stemming from immigration to America. Possessing a unique gift for telling small stories with powerful emotional effects, she conveys the voices of farmers and factory laborers, revolutionaries, writers, artists and craftsmen. The title poem, “Ten Thousand Waves,“ was inspired by a tragedy that occurred on February 5, 2004: more than twenty Chinese laborers were drowned in Morecambe Bay, England, when they were caught by an incoming tide. The title itself is quintessentially Chinese: Classical poets in China would invoke “ten thousand” when they meant to say “many,” “a vast number” or, in combination with miles (“li”), that someone or something is “very far away.” To use the hyperbole now is not without risk; but strangely, used in combination with waves, it escapes the danger of becoming a worn metaphor. It calls up the image of endlessly onrushing waves. It ceases to be a metaphor. It becomes photographic. Wang Ping, a native of Shanghai who lives and works in Minnesota, does not succumb to the lyrical and romantic histories of the phrase. She invokes no vast and peaceful plains, no multitude of mountains crowned by the cabins of Taoist hermits or by Zen Buddhist monasteries. In other words, she rejects the seductive option of being both easily digestible and anachronistic. The book’s title is an allusion to a tragic event in recent history with a very contemporary social context—that of the globalized economy. It was the cruel sea that took the lives of twenty undocumented Chinese workers when they miscalculated the return of the tide in Morecambe Bay, somewhere East of the Isle of Man, in Northern England. 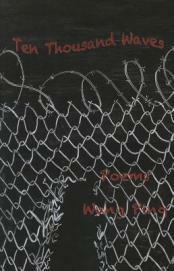 The book, and the title poem in particular, confronts real life conditions of so-called illegal laborers arriving in Europe, or in the States, in the twenty-first century. And yet, using the term “ten thousand” is also an indication that the book itself, not just the title, employs many elements originating in Chinese literature. Wang Ping lived long enough in her native country to earn a Bachelor of Arts degree, and her poems reveal not only aspects of today’s China, they also reveal something about America. They show us the shadow behind the voice that speaks and is heard in these poems: a woman at the crossroads, a woman anchored now in America, who remembers the past and confronts the present in the “old country.” These poems engage in a dual critique of an American way of life and the West’s betrayed values, and of China today—the country, or rather society, that abandoned hopes for the sake of money and fast development. It is a country that produces, in the hearts and minds of its citizens, different reactions to it contradictions. They are reactions that reach from the wish to flee to the American dreamland to the desire to return to the simple, honest, and just ideal ensconced in Classical Chinese texts. Saturated with echoes of two different cultures, this volume reveals the richness and vibrancy of contemporary American poetry. Clearly, the woman’s voice in the poems (an alter-ego of sorts) sets herself apart from her “American partner,” as they encounter Chinese men and women, also members of ethnic sub-groups (like the Hakka or kejia ren) or of minorities like the Yi or Nuosu. She is seeking to establish a closeness with the locals, no matter how much she is the Other out there—someone from America. In the poem “Bargain,” when the speaker and a hawker address each other, we witness the collision of traditional and modern ways of conveying deference or respect. “Big Sister,” as the local uses it, translates the word jiejie (elder sister), as opposed to meimei (younger sister) into English; it connotes both closeness and politeness, in addition to the old deferential way of acknowledging a hierarchy between younger and older persons. And here in the modern, alienated context, it is also a type of calculated sweet talk of the local girl addressing the imagined wealthy Chinese living abroad (who is expected to buy something from among the offered wares), while indicating simultaneously the lower position of the hawker—the “poor person” in this situation. Refraining from using the correlating term “meimei” (little sister) and saying “xiaojie” or “miss,” instead, the Chinese-American speaker of the poem painstakingly tries to make clear, I’m determined to be polite; I want to treat you as an equal, even if you get on my nerves with your stubborn refusal to lower the price. “Xiaojie” is a middle class and almost an upper class term; it is modern; it is formal; it establishes a formal distance. The inability to reestablish the jiejie—meimei correlation reflects the distance between the two. The last lines of the poem tell us that she realizes the consequences of her formality when she is back in the States, looking at the “trophy” acquired for nine yuan during her visit to the motherland. She understands suddenly how she has internalized way too much of the new culture she has immersed herself in, after leaving China many years ago. The presence of the voices of the Others—Chinese persons who have not left China, but some of whom dream of going to America—complicates the poems, turning what might be mere narrative into a dialogue, an exchange of standpoints, worldviews, sometimes a collision. In modern poetry, particularly in China between 1919 and 1949, this was a preferred poetic device that would render a social contrast more visible to readers. Wang Ping has used this device sensitively while transposing the modernist literary heritage of China’s great epic poets into a contemporary American English diction. These poems often speak with the re-born voice of Ai Qing, but also with the voice of Carl Sandburg when he recalls the cries of the factory girls jumping from the windows in the fourth floor of a sweatshop in Lower Manhattan that is ablaze. The same compassion is in Wang Ping’s poems, and the same brave attempt not to be overly emotional, not to become sentimental, but to remain the chronicler of small joys and great suffering, of mistakes made and uprightness. She is a committed yet detached observer, filled by a deep reverence and love for humanity, but also aware of this “busy monster manunkind” that we are. And she cares, no doubt, for both China and the country that has become her new home; it is a sad, bitter love that seeks to stir and awaken the reader, for she knows that all of us are thrown into an age of turmoil, wars, and fierce competition, where the necessary answer seems to be a clear-minded analysis of the impasses we face. This entry was posted in Uncategorized and tagged Fall 2014 on November 10, 2014 by Kelly.